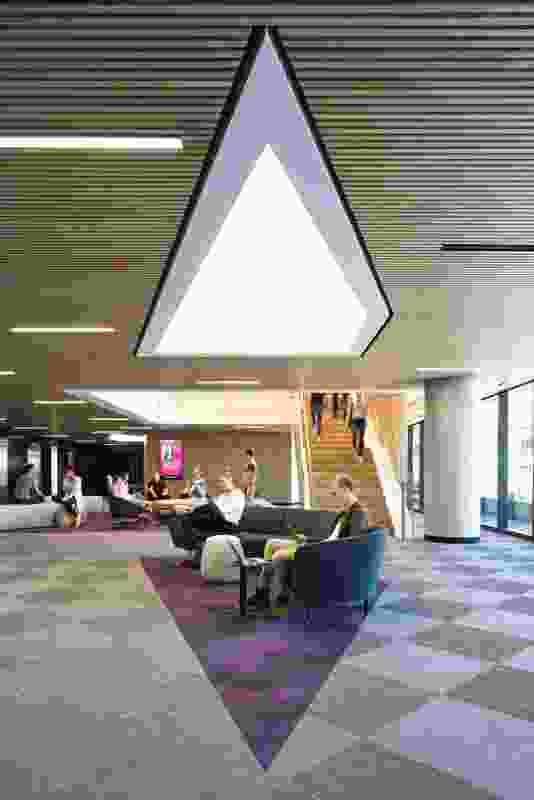 Allegory of a Cave by Emily Floyd at the entranceway of 1 Parramatta Square by Architectus. 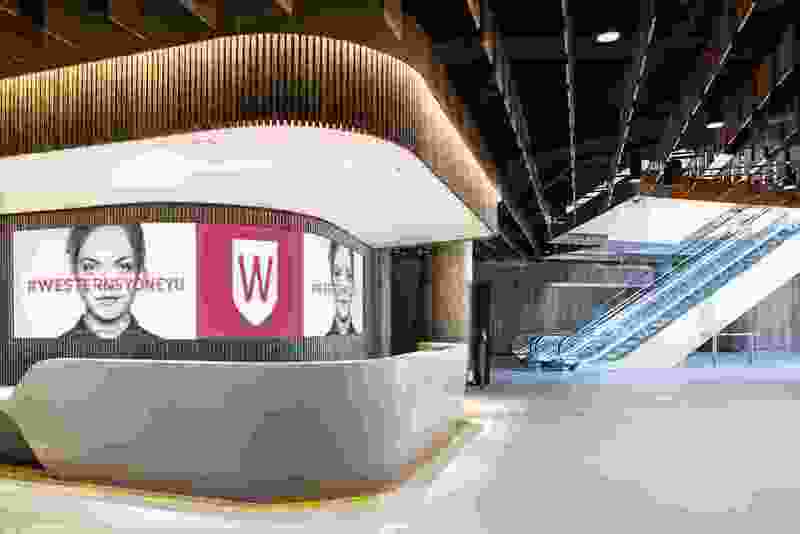 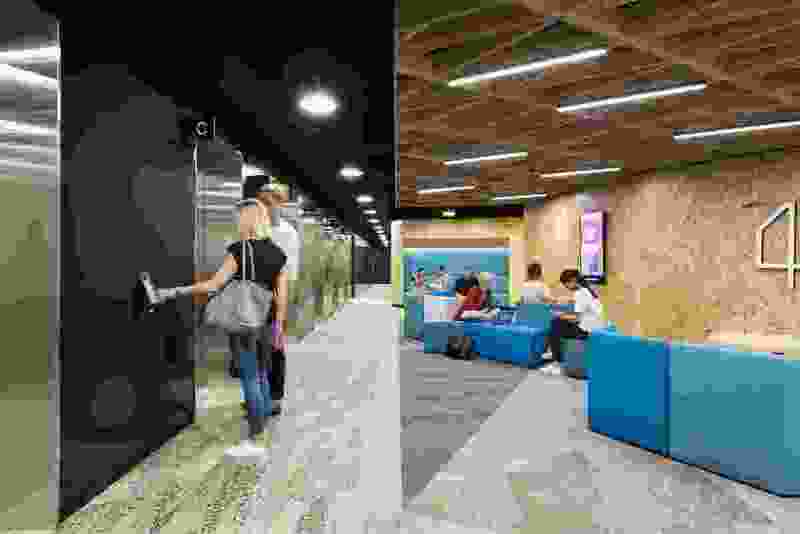 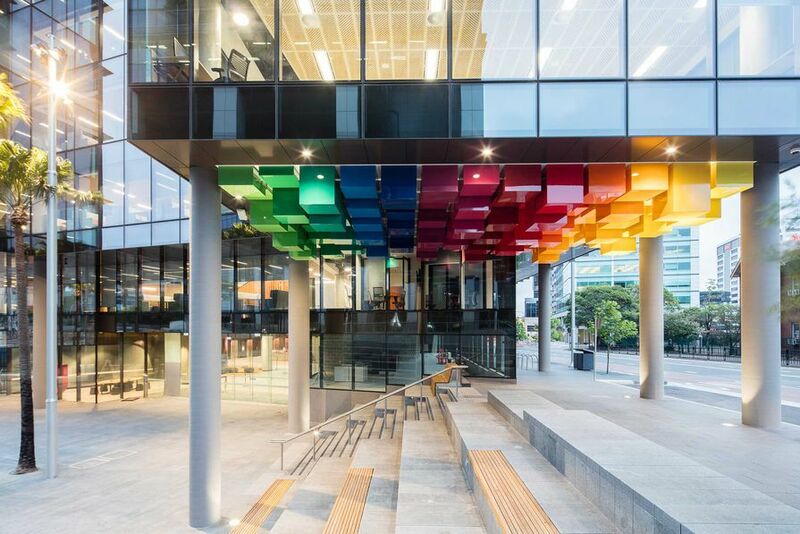 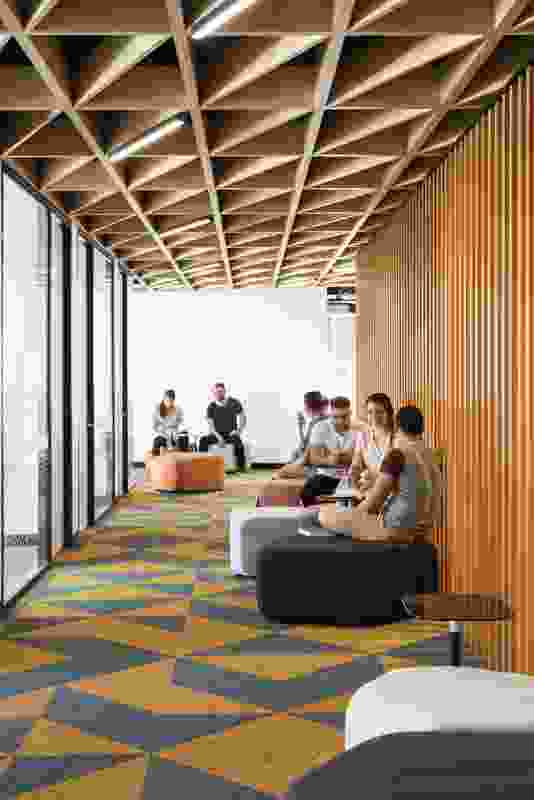 Western Sydney University has opened its new, Architectus-designed high-rise campus, with interiors by Woods Bagot, in Parramatta’s CBD. 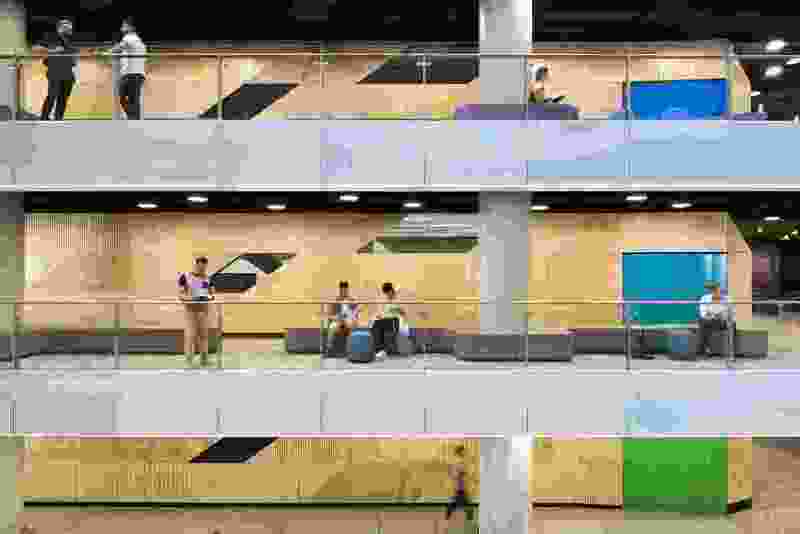 The 14-storey, $220.5 million building houses 10,000 students, mainly from the university’s business school. 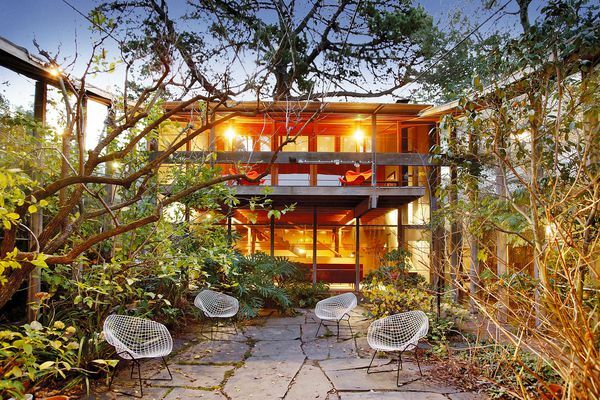 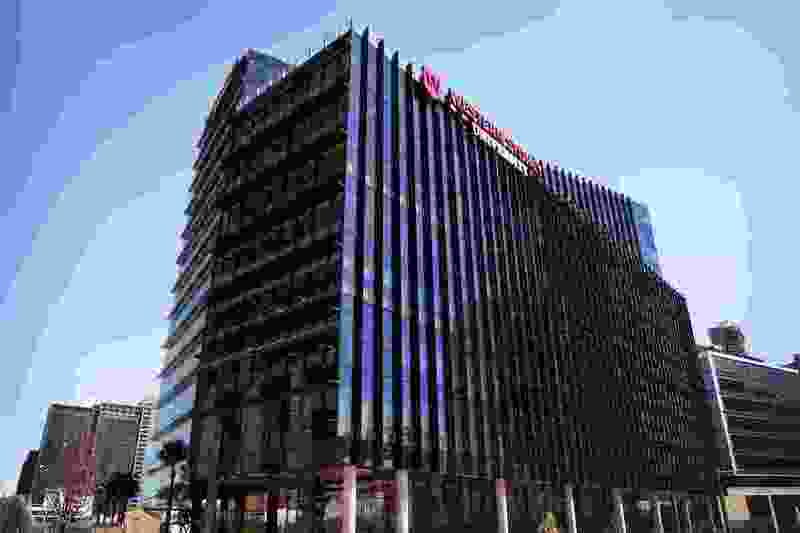 The building also serves as an office for Water NSW and Price Waterhouse Coopers. 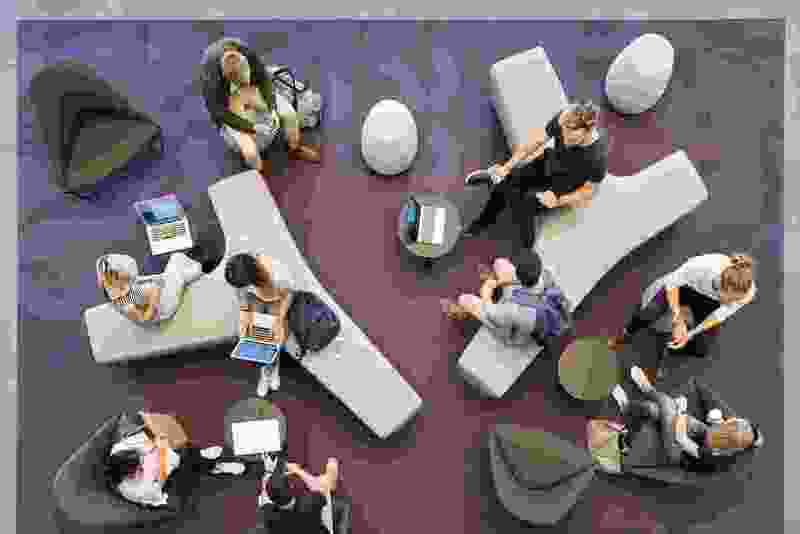 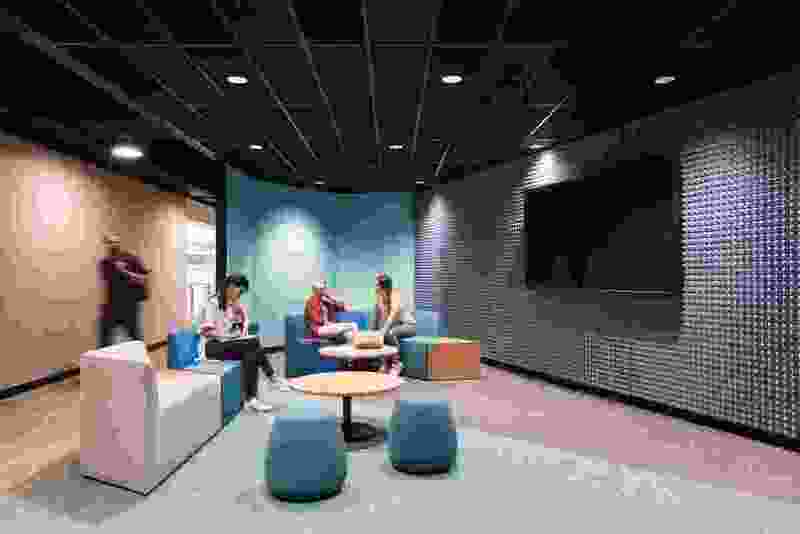 The Peter Shergold Building, named for UWS chancellor and former public servant Peter Shergold, has done away with conventional lecture theatres, instead opting for smaller, informal study rooms and a high level of digital integration that includes more than 550 digital screens and information panels located around the campus. 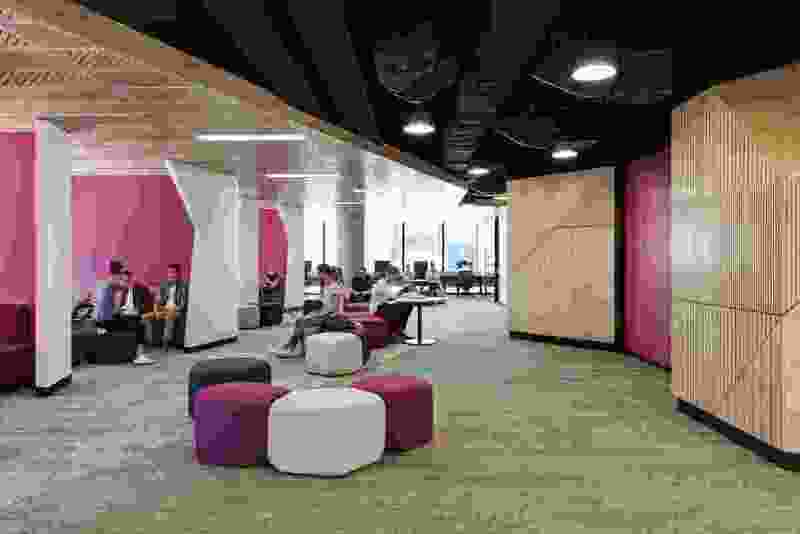 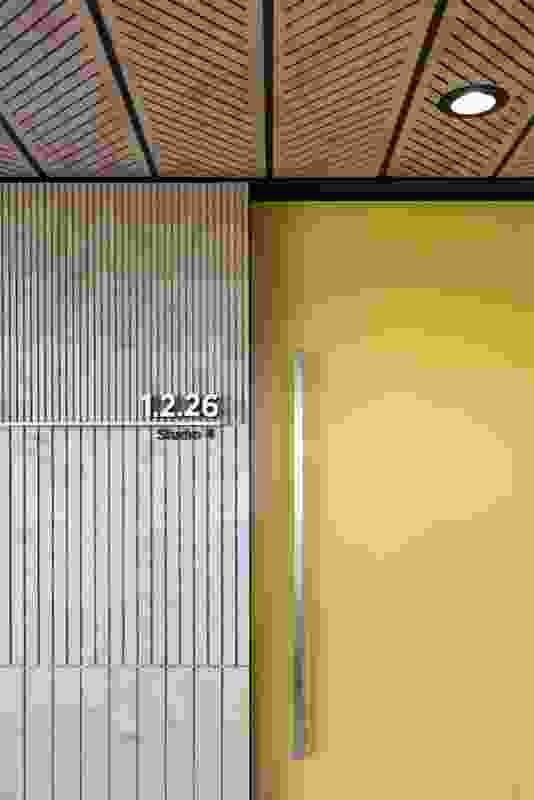 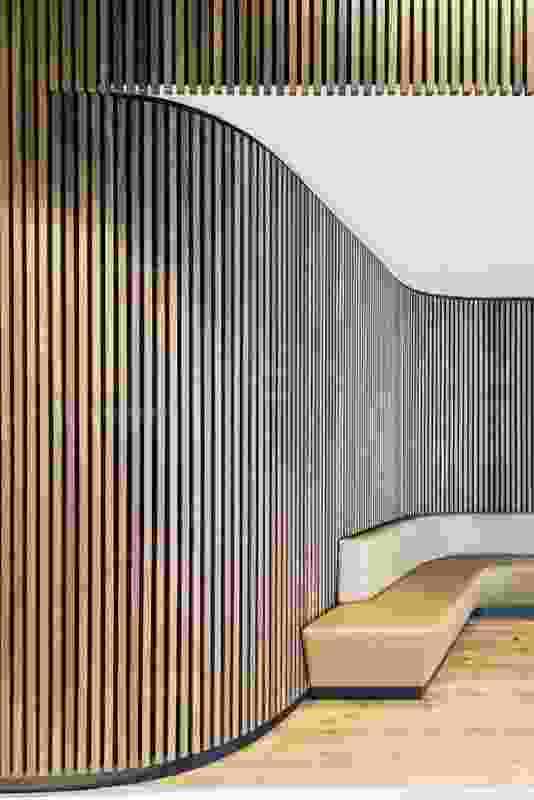 1 Parramatta Square by Architectus, interiors by Woods Bagot. 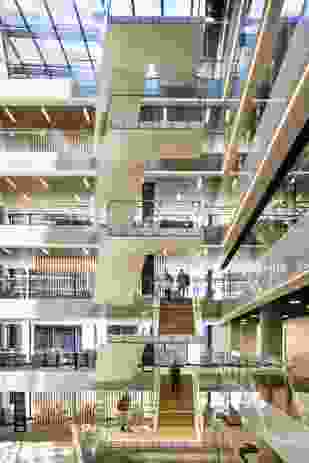 Architectus managing principal Colin Odbert said, “the new vertical campus will showcase how workspaces and education can unite to deliver a smart and energy-efficient building with digitally infused, technology-rich teaching and learning spaces.” In keeping with this commitment to technology, the building was designed to achieve both five star Green Star and NABERS energy ratings. 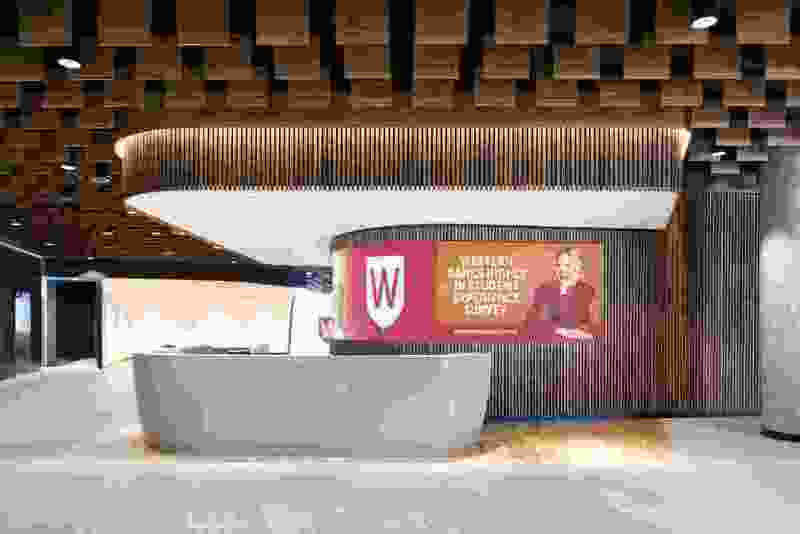 The WSU building is the first completed part of the $2 billion redevelopment of Parramatta Square. 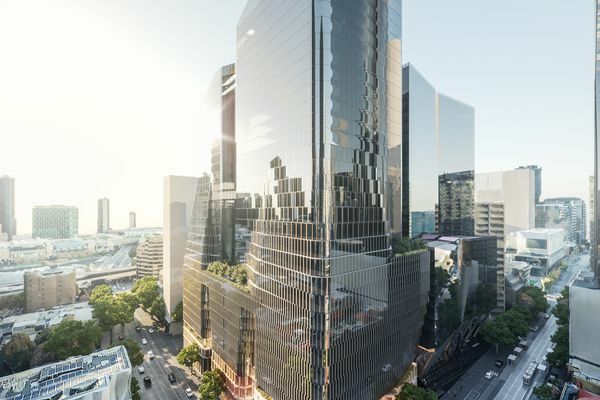 The precinct will eventually be home to a community and civic space by Manuelle Gautrand Architecture, DesignInc and Lacoste and Stevenson, a twin-tower commercial development and a standalone commercial tower by Johnson Pilton Walker, the 306-metre-tall Aspire Tower by Bates Smart and a 20,000-square-metre public domain by a consortium comprising James Mather Delaney Design, Taylor Cullity Lethlean, Tonkin Zulaikha Greer and Danish firm Gehl Architects. 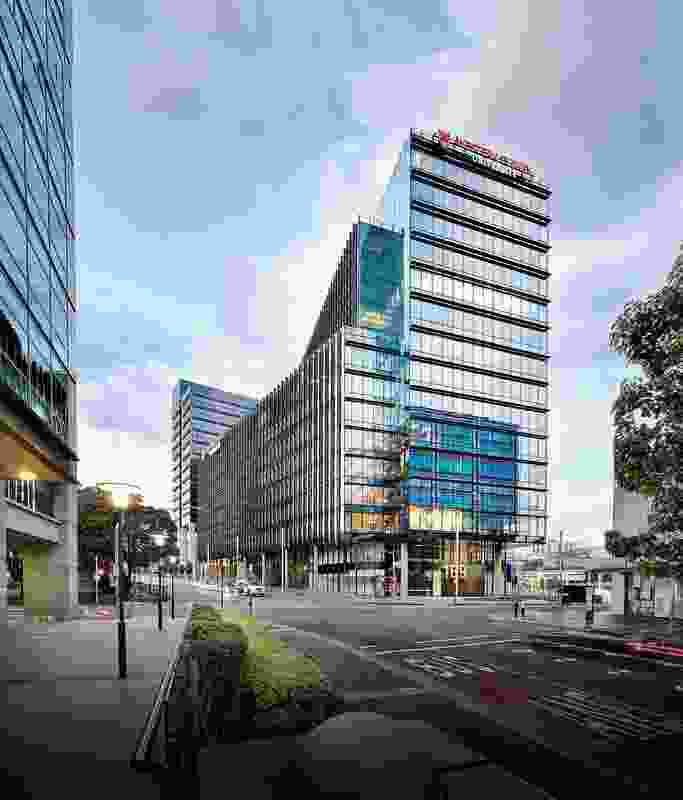 “The design of 1 Parramatta Square draws together urban design, architecture and landscape architecture to create a place that significantly contributes to the revitalization of Parramatta Square,” said Odbert. 1 Parramatta Square by Architectus.